Sagrada Família, is a very uniquely designed church, very creative architecture. Yes, it’s got to be one of the most extraordinary places I’ve been. I was so surprised to see the magic square in the back. 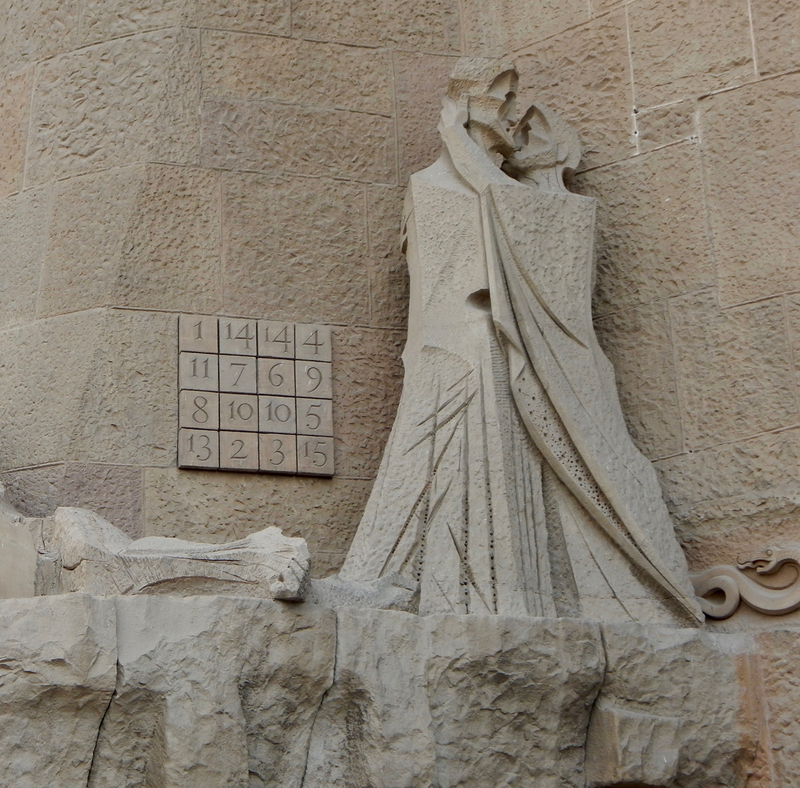 Of course, it cheats a little with the double numbers and the absence of 12 and 16, but it’s an amazingly clever idea. To go all Da Vinci Code on the top row we find (according to John 1.14,14.14, 14.4) The Word became flesh and made his dwelling among us. We have seen his glory, the glory of the one and only Son, who came from the Father, full of grace and truth. If you ask me for anything in my name, I will do it. And you know the way to where I am going. The four corners according to John 1.4, 13.15) Do not let your hearts be troubled. You believe in God; believe also in me. I have set you an example that you should do as I have done for you. I noticed the cheat on the magic square as well and thought maybe it wasn’t a ‘cheat’. Maybe the artist added a subtle message? If I recall correctly, the famous Durer woodcut magic square had 15 and 14 in the middle of the top row, and it was created in 1514—so there’s certainly precedent for hidden messages. Just checked Matthew, Luke and Mark. Nothing much there, I’m afraid. And of course my memory was wrong on the Durer item. The 15 14 appears in the middle of the bottom row, and it’s a copperplate engraving.